DIGITAL RESOURCE. 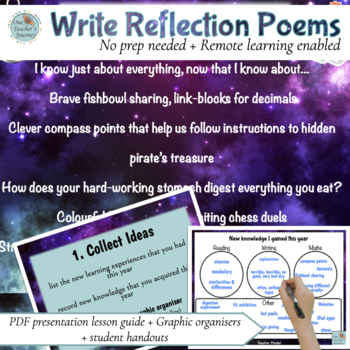 This is the fifth in a series of full colour PDFs for poetry motivation, created by a teacher for other busy teachers. Great for wrapping up the end of the school year and exploring reflection. 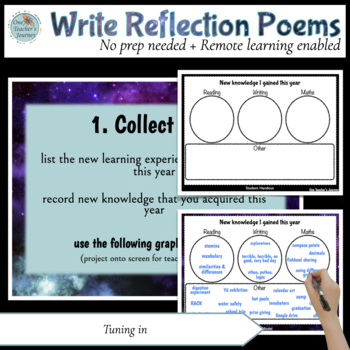 It takes teacher and students through 3 easy steps for effective poetry writing, for this format. This resource contains graphic organisers (in UK & US spelling) suitable for printing or photocopying and the publishing templates give students' presentations a professional touch. Choose between the illustrated or un-illustrated option where students can draw their own, for their poems. Teacher models and exemplars are also included. Landscape layout suitable for viewing through data projector for junior/middle primary or can be used for independent viewing by senior primary students. Presentation consists of 26 slides (pages).